However, there are always exceptions to the rule. In this case, you’re in luck! 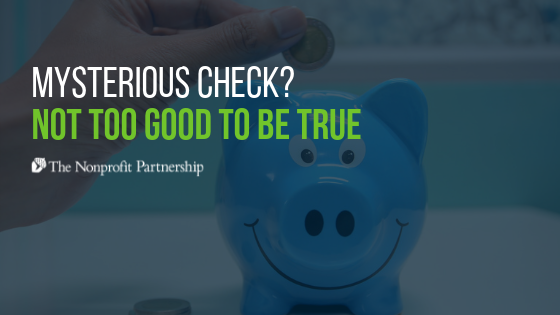 This check is not an elaborate scam designed to steal your organization’s routing number. Instead, it’s the result of donations made to your organization via a network of partner websites and transmitted to you by a company called Network for Good. By day, Network for Good sells fundraising tools, including integrated fundraising pages, to nonprofits. And because the company already had experience in nonprofit fundraising and had developed a donation processing platform, they were tapped to work with Facebook (and a handful of other sites like Google and Charity Navigator) to process online donations, too. So how does the donation get from the donor to you? When someone donates to your organization on Facebook, Google, Charity Navigator, or another partner site, they’re technically making a donation to Network for Good’s Donor Advised Fund. Network for Good then turns around and grants that sum of money to your organization — as the donor has advised them to. This is why your organization gets one check from Network for Good, rather than individual checks with your donors’ names in the “from” column. If you’ve received an unexpected check in the mail from Network for Good, that means you are not registered with them. Even though you don’t need to do anything proactive to begin receiving donations via Network for Good, you absolutely should register with them. Why? You need to thank your donors. Despite the sensation you may feel when you open an envelope and discover an unexpected check and no donor list enclosed, this is not free money. This check is the result of a lot of hard work — performed over the course of weeks, months, years — carried out by your marketing, development, program, and executive staff, not to mention your volunteers and vocal supporters. They have spent umpteen hours building your organization and spreading the word about the good work it does. And it’s this hard work that has motivated real people to give their hard-earned money to your organization. This money isn’t free, it isn’t random, and it didn’t come from nowhere. With these factors in mind, you have an obligation to track down whatever donor information may be available to you in order to thank your donors. Here’s the sticky part. Say you’ve registered with Network for Good. You log in to your new account, excited to export your donor information so you can send out tons of beautiful, thoughtfully-composed thank you letters, but when you reach your dashboard there’s… nothing. No donor information available. Odds are those donations came from Facebook. Remember how Network for Good partners with Facebook? And that when donors donate to you through one of Network for Good’s partner sites, it’s a pass-through donation rather than a direct donation? Unfortunately, and despite its questionable app-related data sharing practices, it is Facebook’s policy to not share donation information with third parties. In this case, Network for Good is the third party. Since the donation was not made directly to your organization, Facebook will not share the donor information with Network for Good, so they do not have it to give to you. But wait — while you’ve missed out on getting the donor information for this check, you can avoid this painful snafu in the future by signing up for Facebook Payments. This enables your organization to directly receive donations through Facebook. When you sign up for Facebook payments, you’re now the first party rather than a third party and can access your donor information through your Facebook dashboard. Whatever your personal opinions on Facebook, it would be a mistake to not register for the good of your organization. You should be thanking your donors for all of the compelling reasons listed above, and when you’re getting donations through Facebook or could possibly get donations through Facebook in the future, signing up for Facebook Payments is what allows you to do that. Once your organization is registered with Facebook Payments, there’s still the slim possibility that you won’t be able to access information for every donor. But that will be because your donors have elected to remain anonymous. If this is the case, you’re fine to give up the hunt for their information, understanding that they want to give quietly and anonymously and secure in the knowledge that you've done everything you can to send that thank you. Now that we’ve tackled your check’s origin story, let’s address this “giving system agreement” that Network for Good says you’re agreeing to by depositing this check. Before depositing the check, you should read the full agreement in order to determine that your organization meets all of the required criteria to be able to accept the donation. Once you’ve done that, you’re free to deposit your check! Now that you know where your check came from and understand the good giving agreement, take a few minutes to register with Network for Good and Facebook Payments. Then start writing those thank yous!